The decorating contest at the courthouse renews a tradition wherein the interior doors and county row offices are decorated for the holiday season. This year’s theme is: “Classic Christmas Movies.” Winners will be announced during the courthouse tree lighting ceremony. The courthouse is open to visitors all day Friday and Saturday and is a stop that the entire family will enjoy. County employees are encouraged to wear period costume to work on Friday. Join the Cambria County Commissioners and county employees as they bring in the Christmas season at the courthouse with the lighting of the 30’ tall Christmas tree, positioned in the rotunda of the courthouse. The historic stained glass dome above the rotunda displays the Cambria County seal, and allows sunlight to fill the rotunda. County employees surround the open rotunda on three levels to sing Christmas carols. Wassailing is the custom of going door-to-door singing carols with a wooden wassail bowl, in hopes of gifts of food and drink. Each region in England had its own traditional “wassailing songs.” These songs all had the same theme: to bid good health to neighbors, friends, “kin and kinsfolk,” and all the cows, horses, dogs, and apple trees within the village bounds. All the best for a Joyous and Merry Christmas and a Happy, Healthy, and Prosperous New Year! The entire community is invited to participate in our gingerbread contest, sponsored by the Cambria County Historical Society. While the contest is for entrants age 18 and under, everyone is welcome to display their own gingerbread masterpiece! The structure of the entry may be made of non-edible materials but all visible surfaces must be edible. 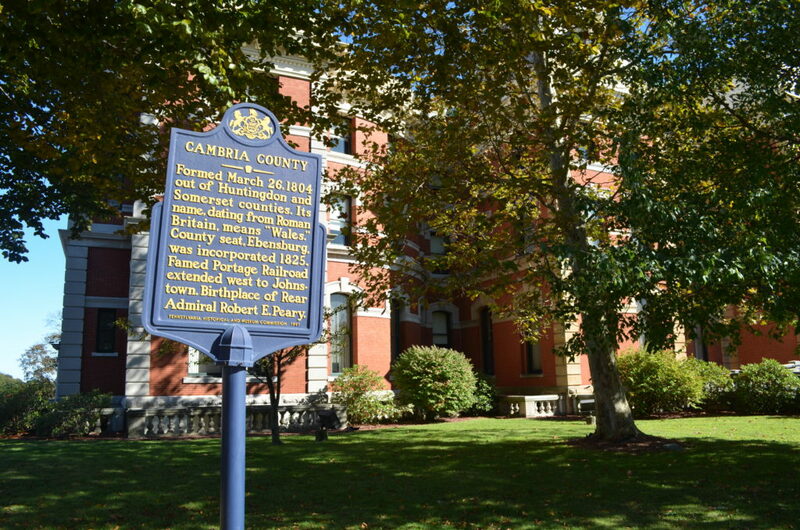 Prizes will be awarded for most representative of the HOLIDAYS, most ARTISTIC, most representative of CAMBRIA COUNTY HISTORY, and Most Creative. Entries must be dropped off at the Historical Society between 10am and 4pm on Tuesday, November 20th through Thursday, November 29th. NO ENTRIES will be accepted on Friday. Call 472-6674 if you have any questions about the dates and times for drop-off. Join the fun and start your own Christmas tradition! Visit the gingerbread display from 10 am to 4 pm and 6:30 pm to 8:30 pm on Friday, or on Saturday from 12:30 pm to 3 pm during the Holiday Open House, and throughout the holiday season. This traditional opening of Ebensburg’s Christmas season is made bigger and better for the Dickens celebration. Enjoy a holiday performance of Christmas carols. The Mayor will proclaim the official opening of Ebensburg’s “Dickens of a Christmas”. Those attending will be invited to sing Christmas carols. Warm up with hot chocolate and enjoy a tasty treat. Immediately following the Light-Up Ceremony, stroll to your choice of holiday events, join carolers about town or just enjoy a stroll through downtown to see a wonderful holiday light display. Period costume is encouraged, but not required. As part of Ebensburg’s “Dickens of a Christmas” celebration, Cresson Lake will be “singing in the holidays” with a program of Christmas music performed by some of the best vocalists in the region. We’re also including a sing-along of carols with the entire audience. Performances are Friday at 7:30 p.m. and Saturday at 2:00 and 7:30 p.m. in the beautifully restored Courtroom #1 at the Cambria County Courthouse, 200 S. Center Street in Ebensburg. Tickets are only $10 and will be available at the door and by calling 814-472-4333. Got pudding? If not, it’s time to stock up – especially on the figgy variety. Because if carolers show up at your door singing “We Wish You A Merry Christmas,” be warned: They won’t go until they get some. Some of the earliest carols still in common use today date back to the 17th Century, like “Greensleeves.” By the 19th century, caroling evolved into a purely Christmas treat, spurred on by the work of Charles Dickens in A Christmas Carol. In Dickens’ day, there were special wassailing songs offered by groups of children (sometimes of the poor) out wassailing through their community. They were often composed by the singers and conveyed musical wishes for good-health. Of course one of their important purposes was the solicitation of special holiday drink, food or money. The wassailers customarily carried bowls of the hot drink, wassail, and offered sips to prospective donors. The practice of begging from door to door remained well into the 20th century, even in America. In the 1930s and ‘40s, New York City children dressed in ragged clothing and dirtied their faces, rang doorbells and asked for pennies. Residents are encouraged to form their own caroling groups. It’s great holiday fun for those participating, and it’s enjoyed by the community. All “wassailers” are encouraged to dress in Victorian Dickens style costume in the spirit of the event. You have to see it to believe it! Experience Ebensburg’s small town charm during this holiday weekend. Stroll the streets of downtown Ebensburg after dark and enjoy an absolutely dazzling display of white lights. The holiday wreaths around the Victorian streetlights, the lights that illuminate every tree along the downtown streets, and the holiday displays in store windows makes Downtown Ebensburg truly magical. Be sure to visit Kimball Park, Penn Eben Park and Veterans’ Park at night for an outstanding holiday light display. Drive through Ebensburg’s neighborhoods and let our residents share their Christmas spirit with you. Their homes are adorned with lights and Christmas greenery. Throughout Ebensburg, smiles are bigger and arms open even wider at Christmas! If we’re fortunate, a blanket of white snow will add the final touch. When Isaiah told of the coming Prince of Peace, he spoke of light dispelling darkness. The metaphor of light is central to our celebration of Christmas and its meaning. Christmas arrives again with all the promise of remembrance and celebration.